When you enter Mr. Morgan’s Library, you never know what you’re going to find, since the curators are always surprising us with treasures from the archives. Remember when the volcano spit ash all over Europe several years ago and all the flights were grounded? The Magna Carta couldn’t get home, so it took up residence for a few months right in front of Mr. Morgan’s big fireplace in the East Room. 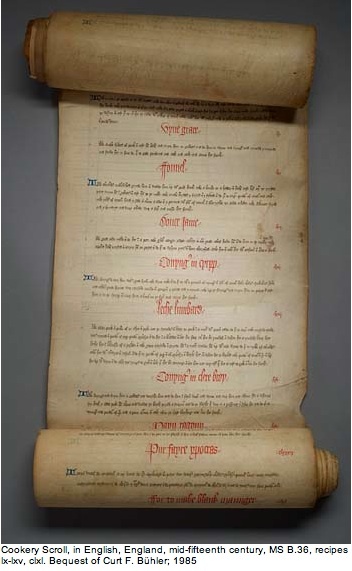 If you get over there before October 6, you’ll get to see something just as unique – a scroll from the mid-1400s containing 200 recipes (in Middle English, of course) that are fit for a king or royal lord. Move over, Smorgasburg! The scroll would have been created by foodies some time around the reign of Henry VI (1422-1461) or Edward IV (1461-1483) during the War of the Roses. Henry’s objections to the aristocrats’ rights protected by the Magna Carta led to civil war, which was won by Edward, his successor from the House of York. At least someone was eating well and practicing penmanship during this tumultuous time in Merry Olde England. 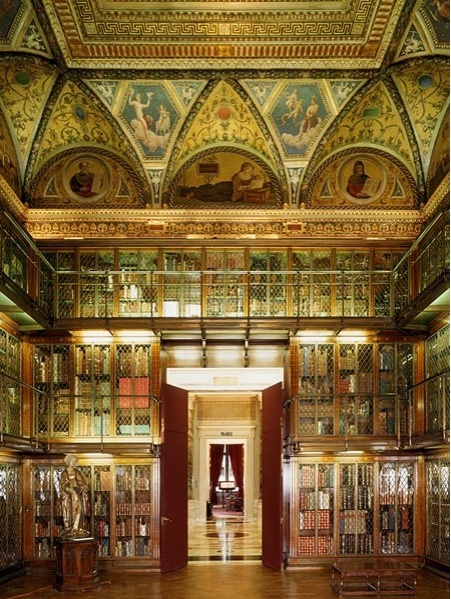 The cookery scroll is displayed right inside the library door, past the historic marbled rotunda, keeping company with one of Mr. Morgan’s three Gutenberg bibles just opposite. It’s fitting that these two treasures are holding court together: one showing the hand-crafted way that oral traditions of the one percent were being preserved; the other suggesting the revolution that was about to unfold as movable type and printing presses made the printed word universally accessible. Check out the amazing digital facsimile of Mr. Morgan’s printed treasure. The scroll is part of an ongoing exhibition series, Treasures from the Vault, which also features music, letters, and manuscripts from the greats of Western culture. Check out the surroundings. Here’s a video of everyone’s favorite still-working Tudor kitchen at Hampton Court Palace. The palace wasn’t built until 1529, but it will give you a visual on how some high-end cooks could have been using the scroll 550 years ago. For more detailed 14th century cooking techniques, check out the YouTube by MedievalArtScience. This entry was posted in History, Museums and tagged arts, culture, food, history, museums, video by mssusanb. Bookmark the permalink.